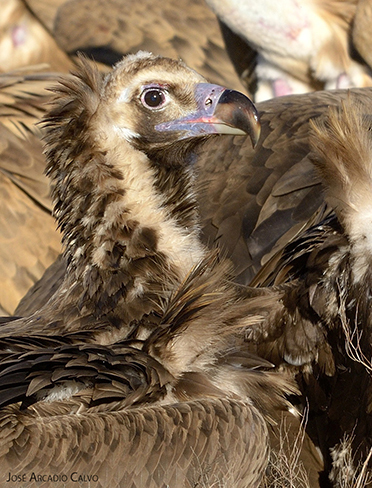 A vulture of great size, they can reach up to one metre in length and exceed 10Kg in weight, with large and wide wings with a wingspan of approximately 3 metres. It is considered the largest bird of prey of the Palearctic. The dominant colour is dark brown, close to black when they are young, which lightens with age. They have a characteristic dark plumage on their head which gives them the appearance of a monk giving them their name monachus. Although they have a large and robust beak, and strong talons with long fingers, they primarily consume small to medium sized prey which allows them to manipulate and tear apart the hard parts of the carcass (muscular and cartilaginous tissue). 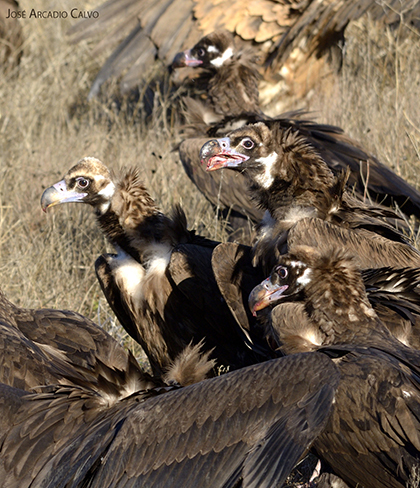 Habitat: in Spain they select forestall habitats in which they can nest and form lenient colonies. In the appropriate areas of abrupt orography they can reach high densities, with the nests being less than 150m apart. The nests are located preferably in mature woodlands on the top third of the mountainside on pine trees, junipers and holm oaks, from where they can make the most of air currents to access and leave the nests. They are constructed by both adults using large branches and they can reach great volume and weight reaching two metres in diameter and surpassing the metre in height. From the colonies they access the feeding grounds which are quite far away; although rarely exceeding the 45km range, they can reach distances further than 80km. They frequent open areas of the plateau, but also visit semi mountainous regions and grasslands. Nutrition: Their diet is based primarily on rabbits and domestic livestock (preferably sheep), as well as wild ungulates (wild boar and deer); it varies depending on the availability of these in the area of influence of the colony and the time of year. Daily trophic needs: Between 500-656g of carcass/day. It is estimated that the annual requirement of a breeding adult is around 300kg. Reproduction: long-living species, with a low annual reproduction rate and high survival rate as adults. The reproductive cycle is very long, starting with courtship in January, and the preparation of the nest in February. They just lay one egg, normally at the beginning of March, and incubation lasts 57 days. The chicks’ development and stay in the nest lasts for more than three months, finally leaving between August to early October. The period of dependency of the young birds is long, feeding has been seen as late as the end of autumn, little before the start of a new mating season. Monotypic species, are discontinuously distributed around the southern Palearctic, from Iberia, the Balearic Isles, southern France (where it has been reintroduced), eastern Balkans (Greece and Macedonia), Turkey, Caucasus Mountains, Iran, Afghanistan, Pakistan and possibly southeast of Kashmir to the south of Siberia, Mongolia and north-eastern China. Part of the population spends their winters in the southern Middle East, southern Pakistan, northern India, Nepal and a small number in eastern China and Korea. In Spain, the reproductive communities are found in several mountainous systems in the southeast of the Peninsula, and in the north of the island of Mallorca. 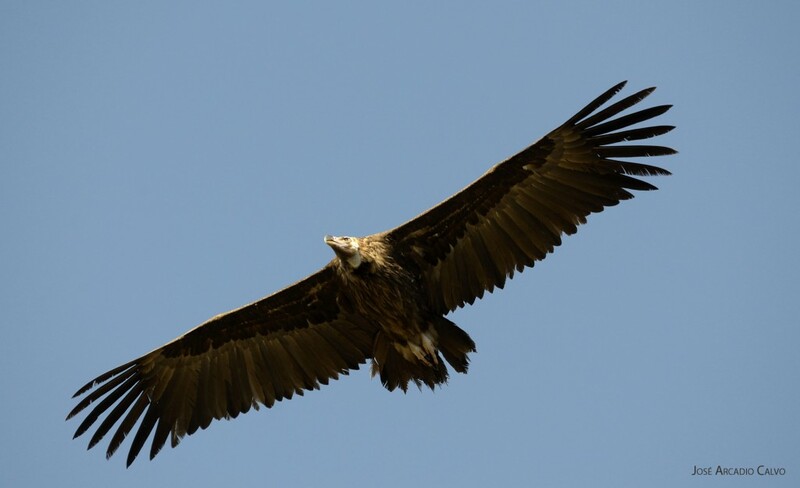 Recently it’s being successfully reintroduced in the Pyrenees around Lerida. The main colonies are found along the banks of the Robazo in the Tajo River, Sierra Los Ibores and Monfragüe in Caceres, Sierra de Hornachos in Badajoz, mountains off Toledo, Cabaneros, Sierra Canalizos and Umbria in the Alcudia Valley in Ciudad Real, towards the south in the Andalusian sierra of Hornachuelos, sierra Pelada, sierra in Andujar and northern mountains of Seville. In Catile & Leon it is present in the south of the region, on the northern slopes of the central range, with colonies in the Carpetanos Hills and sierra de Guadarrama in Segovia, western ranges and central Range in sierra de Gredos in Avila and in Sierra de Quilamas, Alagon river and north of the Sierra de Gata in Salamanca. The global population has been estimated at 7.200-10.000 pairs, of which some 5.500-8.800 are in Asia and 1.700-1.900 are in Europe. Spain has the largest population in Europe with around 1.500 pairs, 287 of those are found in southern Castile and Leon. The two major threats faced by the species in Europe are direct mortality primarily caused by the use of poisoned lures targeted for the extermination of predators, and the decrease in the availability of food, due to the effect of different epizootics in rabbit populations, and more recently, the disappearance of livestock carcasses due to the application of European Union legislation regarding the removal of dead animals. However, the recently approved statute with regard to this should ease and revert the situation.